At ECS Tuning we've assembled multiple kits of all the major services to help you avoid troublesome hang-ups and costly repairs in order to keep your European vehicle performing at its best. From Assembled by ECS timing service kits and oil service kits, to automatic transmission service kits and everything in between. 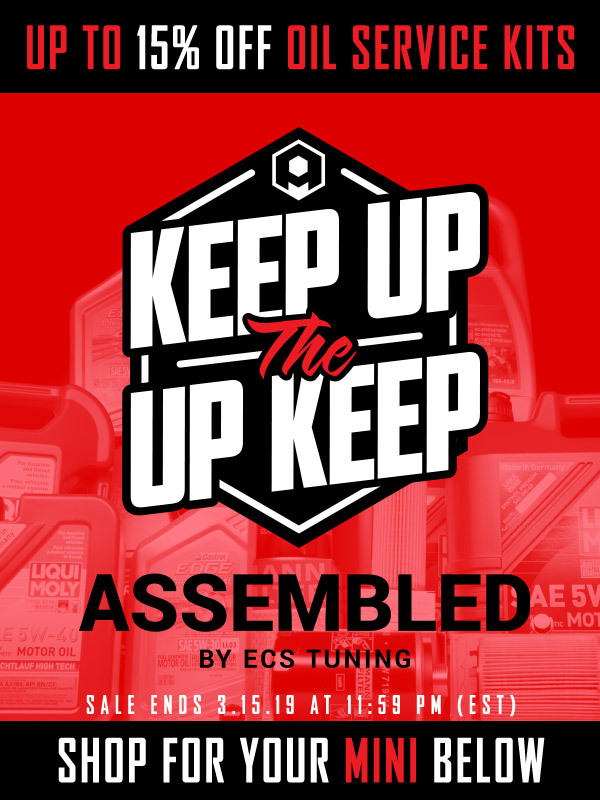 Specifically, put together by ECS Tuning Specialists, Assembled by ECS kits give you the peace of mind that you have all of the correct parts to get the job done. "Click HERE for MINI Cooper Oil Service/Change Kits "
"Click HERE for MINI Cooper Drivetrain Kits "
"Click HERE for MINI Cooper Engine and Timing Kits "
"Click HERE for MINI Cooper Braking Kits "
"Click HERE for MINI Cooper Suspension Kits "
"Click HERE for all other MINI Cooper Key Kits "
Last edited by ECSTuning; 04-12-2019 at 07:29 AM. Quick Reply: ECS ABE Sale!